Bridgton Academy is pleased to announce the hiring of James Hopkins as Head Soccer Coach. 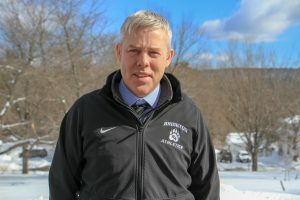 He joins the Wolverine soccer program after spending three years as Associate Head Soccer Coach at his alma mater, the University of Southern Maine, where he was also a three-year captain for the soccer team from 1997-99. Hopkins is a United States Soccer Federation A-Licensed coach, and also holds his National Soccer Coaches of America Association Premier Badge. Hopkins comes to Bridgton with more than a decade of college coaching experience. Beginning his career at USM as a volunteer assistant, he went on to coach the women’s and then the men’s teams at Dean College, finishing up second all-time in wins on the men’s side. He returned to USM in 2017 as Associate Head Men’s Soccer Coach. Additionally, Hopkins was the Technical Director and Head Coach of the Northeast Premiere Soccer League’s Seacoast United Club in Topsham, ME. Hopkins will arrive on campus in February and continue to recruit for the 2019-20 school year—Bridgton Academy’s 212th year—which begins on August 24. Bridgton Academy’s mission is to provide a program for young men in a unique, one-year postgraduate environment to prepare for the competitive rigors of college and beyond. Bridgton Academy is located in western Maine, in the town of North Bridgton. For more information, visit www.bridgtonacademy.org.